Algeria's president, who has not publicly addressed the country for nearly three years, will be running for a fourth term in April. 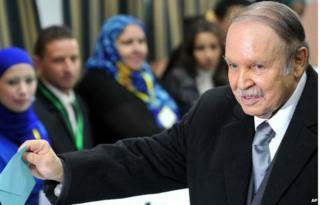 Abdelaziz Bouteflika, 76, suffered a stroke last year and critics say he is still too ill to govern. His candidature was announced by Prime Minister Abdelmalek Sellal. "Even if he has not completely recovered physically, I can assure you he is in possession of all his mental and intellectual faculties," he said. Algeria has the largest land area of any African state, is rich in oil and gas, and under President Bouteflika has been an ally of the US. The president, in power since 1999, is one of the few remaining veterans of the war of independence against France. He is credited by his supporters with curbing a brutal insurgency by Islamist extremists and restoring economic stability. But he has had persistent health problems and his rule has recently been dogged by corruption scandals implicating members of his inner circle. Despite regular elections, power in Algeria remains in the hands of a small group of military and intelligence leaders. The question of whether Mr Bouteflika would seek re-election has dominated Algerian politics in recent months, with normally concealed differences between senior party and military officials emerging in public. This month, a retired senior general urged him to step down "with dignity" and not stand for re-election. One opposition figure called on the president to publish his medical records before seeking office again. Mr Bouteflika has appeared only rarely on television and always in a wheelchair since returning from a four-month convalescence in Paris after his stroke. He appears to have limited movement on one side of his body. Despite his illness, correspondents say he is still likely to win the 17 April election. His National Liberation Front party has ruled Algeria for nearly three decades and opposition political groups are weak. Is Algeria immune from the Arab spring?